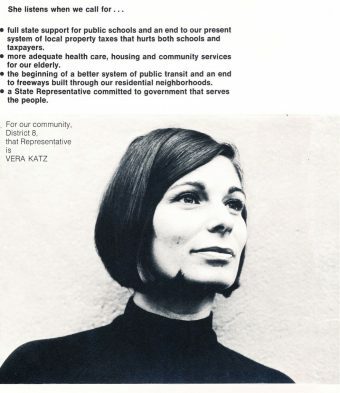 1972 campaign flyer for State Representative District 8, Vera Katz’s first elected position. 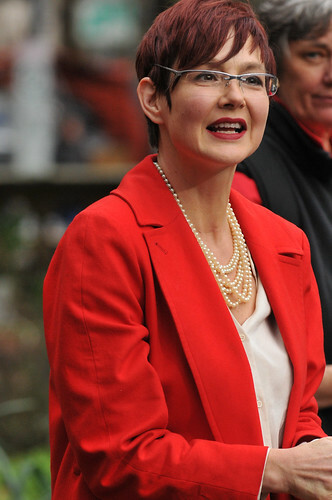 Sarah Iannarone is the associate director of First Stop Portland and a former candidate for Portland Mayor. She lives in east Portland. Former Portland Mayor Vera Katz died last week at age 84. Three time Speaker of the Oregon House of Representatives who went on to serve three terms as Portland Mayor, Katz’s reach was extensive. Part legacy leaver, part urban legend, Katz’s persona looms as large in Portland’s civic imagination as her accomplishments. As someone born the year Katz was first elected and somewhat removed from state and local politics during her tenure, I’m not suited to eulogize her. Rather, I offer a few lessons gleaned from her leadership and thoughts how we might apply them today. When I arrived in Portland in 1998 — one of those twenty-somethings allegedly looking to retire — Katz was just beginning her second term as Portland mayor. I’d rented a one-bedroom basement apartment in the Historic Alphabet District for $500 (remember those?) and my living room windows looked directly onto the front stoop of Katz’s 1890 Victorian. At the crack of dawn on workdays (which included many Saturdays and even some Sundays), her distinctive voice would ring across the yard with a warm greeting to her driver followed by a quickly barked roadmap of the morning’s activities. She wouldn’t get home until usually well after dark. I didn’t know then why my neighbor with the New York accent had no time for small talk on that stoop; I knew only that she seemed important and powerful, a bit of workaholic even, and that she never drove herself anywhere. Bob Stacey (Metro Council), Sarah Iannarone (Portland Mayor), and Sam Chase (Metro Council) have all been endorsed by Bike Walk Vote. 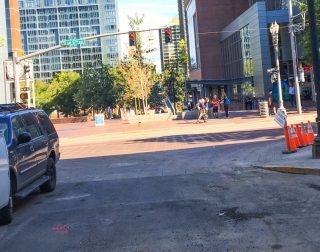 Bike Walk Vote, the political arm of Portland’s transportation reform movement, wants to get you some face time with this year’s city council, county commission and Metro council candidates. On stage at Benson High last night. 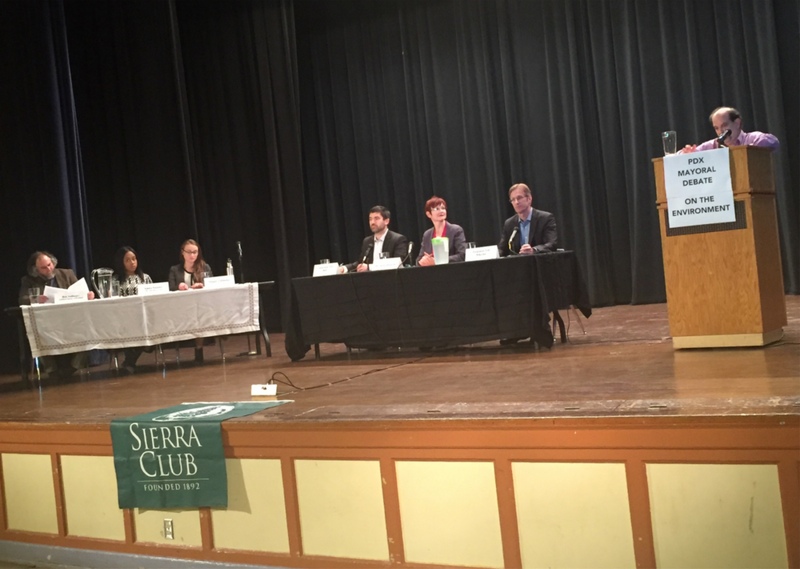 One thing that became clear at last night’s mayoral debate: For the first time in my memory (which is admittedly not very long), all the top candidates are firmly on the left of the political spectrum. 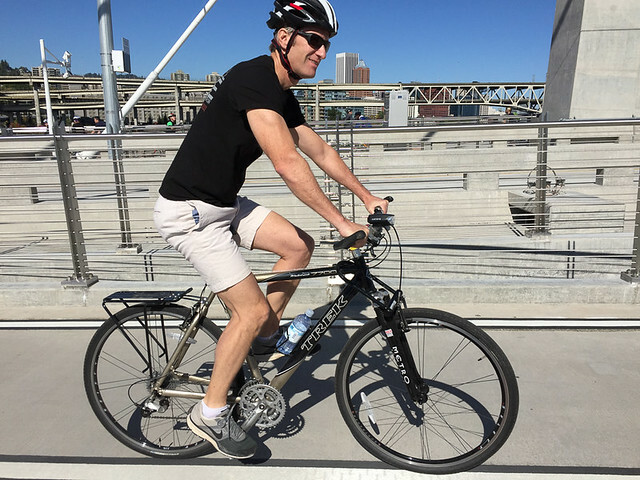 At each of the mayoral races I’ve covered in the past decade there was always a right-leaning candidate who made veiled overtures to business interests and the status quo — especially when it came to transportation and environmental issues. Even our current mayor Charlie Hales was elected after a campaign where he ran as an anti-Sam Adams who would return Portland “back to basics” (wink wink). The three candidates at last night’s debate: Sarah Iannarone, Ted Wheeler, and Jules Bailey, are having none of that. Each one of them are proposing policies that would upend business as usual and would put Portland back at the forefront of truly progressive cities. 2008 event calling for new local road funding. 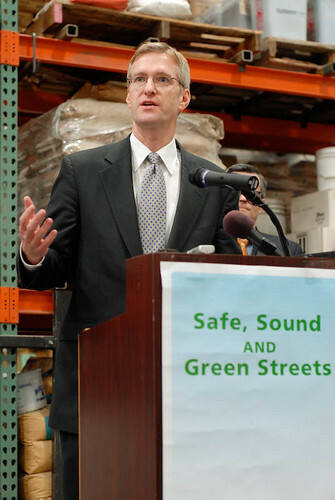 Former Oregon Treasurer Ted Wheeler has reported raising almost 15 times as much money as his closest competitor in the race to be Portland’s next mayor. Among his donors are a wide variety of real estate businesses and Paul Romain, the oil and gas station lobbyist who’s threatened to kill the 10-cent local gas tax increase that Wheeler supports. Multnomah County Commissioner Jules Bailey, the second-biggest draw for donors, has brought in $26,886 since just before declaring his candidacy, compared to Wheeler’s $398,509. The race’s newest candidate, Portland State University scholar Sarah Iannarone, has brought on a campaign manager, so presumably aims to raise money. But she hasn’t been in the race long enough to hit a 30-day fundraising report deadline. Of the other three registered candidates, only David Schor has reported any campaign finances at all, mostly loans from himself. Bim Ditson and Philip Davis haven’t reported anything. 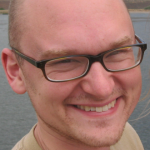 Part of the reason for Wheeler’s lead is that he’s had longer to raise money. But Wheeler has reported $74,542 raised in 2016 alone, triple Bailey’s four-month total. 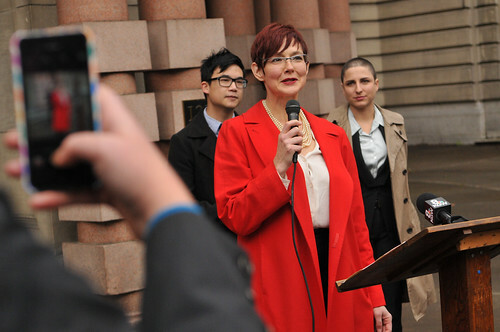 Sarah Iannarone at her announcement earlier today at City Hall. 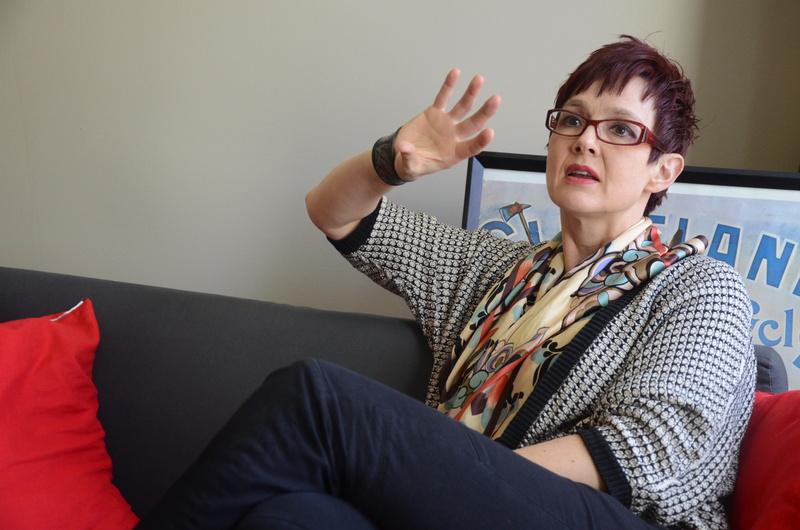 Like most of us, Sarah Iannarone thinks Portland is underachieving. But unlike most people, Iannarone has decided to something about it. Something big. She’s running for mayor.